Is it time for them to drop their "natural" label? Rob Michalak, global director of social mission at Ben & Jerry’s says the environmentally-conscience company is working to ensure that all the ingredients in its supply chain come from non-GMO sources. None of its plant-based ingredients come from corn, soy, or other known genetically-modified crops. The company is also reportedly teasing out a cost-effective way for the dairy farms that supply its milk to use non-GMO feed. 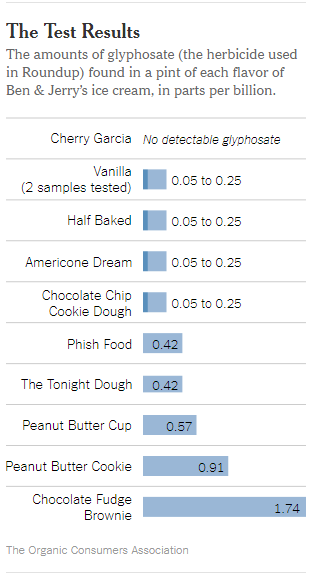 Ben & Jerry’s Chocolate Fudge Brownie showed the highest levels of glyphosate, with 1.74 parts per billion, and glyphosate’s byproduct aminomethylphosphonic acid registering 0.91 parts per billion. To put things into perspective, a 75-pound child would need to eat 145,000 8-ounce servings each day of the ice cream to hit the limit set by the Environmental Protection Agency. An adult would have to eat 290,000 servings, said John Fagan, the chief executive of the Health Research Institute Laboratories, which did the testing for the Organic Consumers Association. Promising years ago to go GMO-free by 2014, Ben & Jerry’s has made strides over the years to make its ice cream more natural, including dropping milk made with Monsanto’s RBST growth hormones. Perhaps the company doesn’t deserve this much heat at this point in time. What a stupid piece of news! At those levels, you’d have to eat a billion pounds of their ice cream to get a lethal dose! Kinda funny to see Ben and Jerry go against gmos and now the same people they wanted to attract are calling for boycotts.